Home» AP LATEST UPDATES » AP TET English language skills Study Material Download. AP TET English language skills Study Material Download. AP TET English Grammar Language skills Study Material Download/AP Teacher Eligibility Entrance test English language Grammar Skills like Articles/Antonyms/ Synonyms/ voice/Direct/Indirect/degrees of Comparison and Parts of speech/ Tenses Study Material Download. AP TET English Topic wise Study material for Paper 1 (SGT)/Paper 2/Paper 3 (SA) /Language Pandits and PETs/Non Languages it is also useful for Dsc Preparations this material is gathered from different study centers and sakshi prathibha pragathi Educational portal's etc. In the matter Study Material for Articles/Antonyms/ Synonyms/ voice/Direct/Indirect/degrees of Comparison and Parts of speech/ Tenses etc are available for useful preperation of Tet and Dsc candidates. 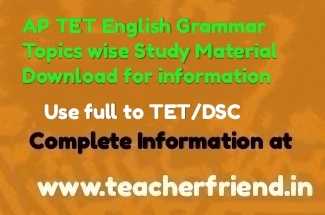 AP TET English Grammar Topics wide Study Material Download. AP TET Paper 3 Telugu Language Chapter wise Study Material Click Here.